This page will be updated during the weeks leading up to the event as more details become available. 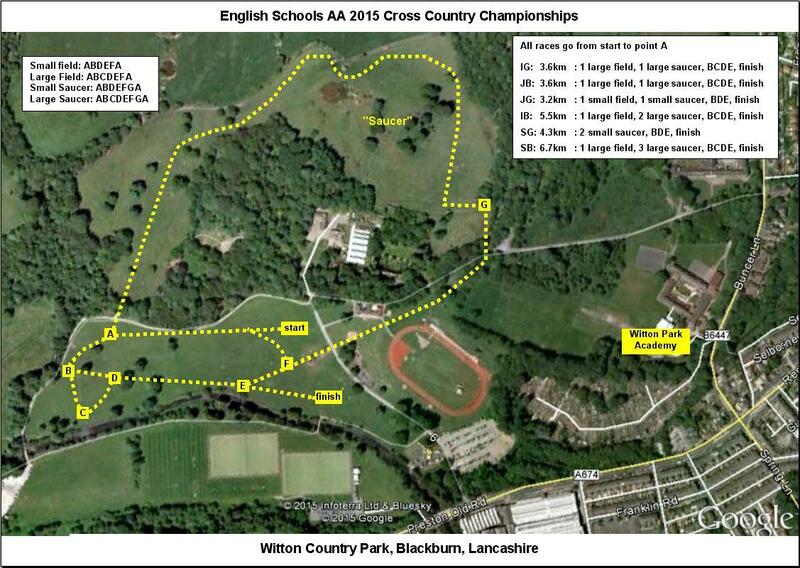 The 55th Boys and 47th Girls ESAA English Schools' Cross Country Championship is to take place at Witton Country Park on Saturday 14th March 2015. Witton Park is well known to those in the North of England and provides an interesting cross country course. It starts and finishes on slightly undulating grassy playing fields, with one very steep climb leading to a pretty, but quite challenging, run across the top of the hill, around the saucer, followed by a fun, long, and fast downhill section with grassy tussocks, passing through a very muddy gateway at the bottom, leading back onto the playing fields. There is a long flat run out at the start and the same at the finish. The course is in a public park so there are no restrictions on access apart from normal park opening times. You can find lots of information about the park from the Blackburn Council website. This includes links to a detailed map showing all the access points and local points of interest. Be aware that because this is a public park there will also be many local people there who are not connected with the ESAA Cross Country Championships and who are simply there for their normal Saturday activities. We ask that you please don't do anything to disturb their enjoyment of their local park which they pay for via their Council Tax! Please ensure that you take all your litter home with you. The nearest train station is Cherry Tree, less than 1Km from the park entrance. Trains leave Preston Station (on the main North Western line) at around 2 minutes past every hour, and take about 22 minutes to Cherry Tree. By road, you can find Witton Park at www.streetmap.co.uk. Enter postcode BB2 2TP. Note that on some maps Witton Park is called Whitton Park. You can also get directions from www.viamichelin.co.uk - enter your own address in the FROM box, and postcode BB2 2TP in the TO box. The most convenient route is probably to take the M65 from the M6 or M61, and turn off at Junction 3 taking the A674 towards Blackburn. The park is then just 4Km on the left. Note that J3 is not shown on some older maps, but it does indeed exist! Be careful when planning your route - don't assume that all the motorway intersections around the vicinity are multi-way intersections, some are just one-way off-ramps or one-way on-ramps. If travelling from the South East, be aware of road works and lane closures on the M1 starting South of Northampton, and going all the way up to the M6 junction. Expect delays on Friday afternoon. For everyone coming from the South, there will always be long delays on the M6 and M5 approaching Birmingham (it is normally better to use the M6 toll at extra cost). There are also the normal Friday pm delays to be expected on the M6 in Cheshire approaching Manchester. Normally, the M6 is pretty much more like a slowly moving car park for most of Friday afternoons/evenings. ** Update to previous information** Many County Coaches will be queuing in the bus lane on the road to the park as they drop off County Teams. Public parking has been allocated in the industrial estate to the South of the park on the opposite side of the road. If travelling from the North, it might now be better to take Junction 31 from the M6 and follow A677 towards Blackburn, turning right onto the B6447, then turn right onto the A674. You will then be able to turn left into the parking zone. Please take care when crossing the road. To allow for easier access and reduce congestion in loading and unloading athletes, coaches will be asked to use different access to the park for both drop off and pick up. Counties alphabetically Avon to Kent will drop off and pick up athletes at Witton Park track entrance on Preston Old Road BB2 2TP. Counties alphabetically Leicestershire and Rutland to Wiltshire will drop off and pick up at Witton Park Academy Trust School, just around the corner on Buncer Lane, BB2 6TD. All Coaches will then go to Blackburn Rovers Football Club, Ewood Park, BB2 4JF where they will remain until it is time for athletes to be collected. Reserved parking space will allocated as close to the finish as possible. Blue Badge holders are asked to contact the ESAA to request a pass, giving the name and car registration number of the pass holder. You need to request a pass at least 4 days before the event. The image below shows the approximate course. The course is liable to modification from that published if ground and/or weather conditions on the day warrant changes to be made. Note that any late changes may result in courses being longer or shorter than originally published, however, the overall difficulty will remain similar wherever possible. Courses are designed to give a finishing time within a normal range for each age group, not to have a fixed distance. 9.00 am - Championship site open for access. 9.30 am - Course open for inspection. As with any cross country event, athletes need to be aware that they will almost certainly finish the day quite muddy, so they must ensure that they have a clean change of clothing and footwear so that they can be allowed back on their team coach - coach companies really don't appreciate having their brand new coach seats and floors being wrecked! We recommend bringing suffient plastic bags to wrap up any kit that might cause damage to any coach interior. Competing for your County Team can be a life-changing experience for children. For some, it is a stepping stone to future glory. For many, it will be the pinnacle of achievement. For parents who may be concerned about what exactly is involved, we have prepared a document detailing what to expect, what not to expect, and a few indications of how things are, and why. All ESAA events are conducted under the rules of UK Athletics (now referred to as British Athletics). You can find all their rules at www.british.athletics.org.uk. ESAA tee-shirts, sweatshirts, and other items will be available at the event from our official suppliers Start Fitness. Lists of all County Teams will be published here from February 23rd as teams details are sent to us. Whilst every effort is made to ensure that names are spelled correctly, mistakes do sometimes occur. Competitors are asked to check these lists so that their name appears correctly in the programme, on the tee-shirts, and in the results. Everything to do with the event is prepared automatically from these lists so if your name is wrong here, it will be wrong everywhere! Please ask your friends/colleagues/pupils to check the spellings of their names. Changes notified to us by noon on Sunday 1st March will appear in the programme, teeshirts and results. Any errors notified after that time will appear correctly in the results, but will be too late to be included in the programme or on teeshirts. Please don't keep re-sending emails requesting spelling changes, one email is quite sufficient. Because of the high volume of mail we receive at this time of year we don't have time to reply to them. Note that team lists here may be incomplete, and may also contain some names which don't eventually get selected - team managers can alter their selections any time up to 28th February. Counties can enter up to 12 athletes in each age group, and 8 are allowed to run in the event. Names published here are not necessarily in selection preference order and your name appearing in these lists DOES NOT MEAN YOU WILL GET TO RUN IN THE CHAMPIONSHIPS. County team managers will make their final team selections in due course and the lucky athletes will be informed either by post or by telephone - you would have been told what your local arrangements are when you filled in your availability forms at the County Championships. If you find any spelling errors, please notify us immediately giving your County, Age Group, and the correct spelling. Counties shown grey have not yet submitted their team lists. ...so why is it so hard to get the spellings right then? Many might just be typing errors, but for interest, in 2009 there were 824 different firstnames, and 2277 different surnames, many of which can be spelled in different ways (even spelled can be spelt in two ways!). Frequently, athletes' names can be passed on to team managers via two or three people, often by phone. The nature of County teams means that the team managers aren't in daily contact with athletes and quite often they've never come across them before. In such cases it is all too easy to hear a name by phone and spell it as one thinks it should be - sometimes schools don't have the correct spellings in their own files. Some names just have too many spellings - even William Shakespeare couldn't spell his own name consistently from day to day! ...the list of alternative surname spellings is just too long to publish here but Johnson, Jonson, Johnston, or Johnstone; Thompson, Thomson, or Tompson; and Howarth or Haworth are regulars! Then there's the whole load of Mc and Mac families to recognise. Finally, thanks to Tom Cox, Ben Cox and Tom Guy who have the easiest names to check! In all Championships competitors must wear at least vest and shorts (or equivalent clothing) in registered County Colours which are clean and so designed and worn, as not to be objectionable even if wet. All visible clothing must conform with registered County colours. Cropped bra tops are not vests by definition and therefore not permitted. Vests by definition must reach the waist at least. Shorts or briefs (in County colours) are the norm for girls. Similarly cycle type lycra shorts, as long as they are shorts and not leggings, are permitted, but only if they are in the registered County colours. Leggings by definition covering the leg below the knee, and body suits or tights, are not vests or shorts and are therefore not permitted. County Colours are those defined by, and issued by, the County Association, not just an approximation of the colours. For instance, if the County Colours are red with blue shorts the red must be the same shade red and the blue must be the same shade blue as those issued by the County. The main problems in the past have been the wearing of cycle type shorts that are not in County colours, and worn under the correct coloured shorts but clearly visible. This especially applies to the boys where the cycle type shorts are longer that the County shorts. However, if the shorts are the lycra type and do not cover the knees then these are allowed, as long as they are in the registered County colours (ie. the same colour as the County colours, not an approximation to them). The pictures here indicate the sort of clothing that will result in athletes not being allowed to compete. The course is on mixed-use land which is grazed by farm animals. As a matter of normal daily life, we advise that athletes and spectators check that they are up to date with anti-tetanus injections - don't forget that you need a booster jab every 10 years.